PAPRIKA: PAPRIKA started as a Balkan band made of classically trained musicians who also loved playing traditional and gypsy music. 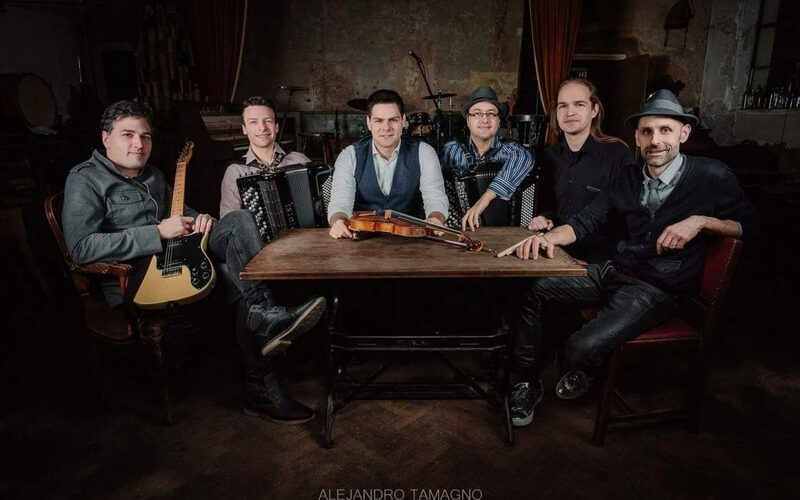 Their focus is on bringing rare and lost traditional Balkan music back to life through their unconventional formation of violin, two accordions, guitar, bass and percussion. Their Balkan ballads and dance songs, known as Kolos in Serbia, or Horas in Bulgaria and Romania, have taken them out into the clubs and festivals of the UK and beyond. PAPRIKA have toured extensively throughout Europe, Australia, New Zealand and Japan and have appeared at the Purcell Room, Royal Albert Hall, Sydney Opera House, Glastonbury Festival and Edinburgh Fringe Festival, as well as WOMAD festivals in the UK, Spain and Abu Dhabi. They have performed on World on 3 for BBC Radio 3, BBC Radio Five Live, BBC 6 Music on “Cerys on 6” and were also featured on UK television Channel 4’s “Come Dine With Me”.